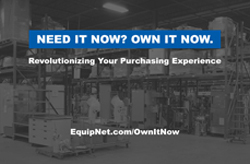 The world’s most comprehensive surplus asset management company, EquipNet, Inc., has launched a revolutionary new sales channel, OWN IT NOW. The platform currently features hundreds of assets valued at $4 million USD, which will be available through the coming months. Inventory includes a wide range of equipment, such as, Lab and Analytical Instrumentation, Processing and Packaging Equipment, MRO and more. Managing Director, Tom Noonan, states “Own It Now introduces a revolutionary sales channel that shakes up the format of a traditional Dutch auction with an innovative twist that allows buyers to instantly win equipment, while prices drop and the clock ticks down”. For further information about OWN IT NOW and the company, please visit our website atEquipNet.com/OwnItNow or contact us today: 781-821-3482 | ownitnow@equipnet.com.